Do you want the perfect lawn? iMow robot lawn mower enables you to achieve this with great ease. No longer will you spend hours in the garden pushing a lawn mower around. Once programmed, iMow robot lawn mower will mow the lawn automatically, avoiding obstacles and mastering hilly terrain. Once the work is done or the batteries need charging, the mower will automatically return to the docking station. And because iMow works so fast, you can enjoy your lawn unhindered. 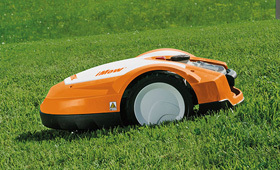 There are various models of the iMow robot mower available. Each model is suitable for different needs, with different factors such as battery life, ideal lawn area and maximum lawn area affecting which mower is the right one. Whether your lawn is 300m² or 4000m², we have the robot mower for you.